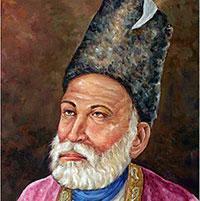 Mirza Asadullah Baig Khan known by his pen name Ghalib was Urdu’s finest poet and master of the ghazal, love poem. He was born in Agra in 1797 and died in Delhi in 1869. His range, imagery, and command of language are stunning. Today his poems are recited by South Asians everywhere.